The dinghy ride up the Ramu River takes nine long hours, but my excitement mounted as we approached the small villages in the lowlands of northern Papua New Guinea (PNG). Upon arrival, we were greeted by children paddling and playing in wooden dugout canoes, and women washing sago palm (an important staple food among lowland populations of PNG) for food preparation. When the rumble of the boat’s diesel motor finally cut out at the small sandbar that would serve as our boat dock for the next several days, we were surrounded by an incredible silence that whispered of the isolated lifestyle and resilience of the villagers. We spent 3 months last year collecting detailed household survey data for a research project investigating how rural communities ensure food security when faced with natural disasters or other unplanned shocks to household food production. After several months of analyzing the data, I recently returned to PNG to discuss the results of our study with government officials and development aid agencies. Papua New Guinea is home to approximately 7 million people, and is struggling to ensure adequate nutrition for its citizens. One of the country’s largest challenges is a lack of data to inform food security and nutrition indicators. With the rising threat of climate impacts, this challenge is becoming more urgent. Quick response evaluations in the wake of PNG’s food production crisis during the 2015/16 El Niño (El Niño Southern Oscillation) noted that insufficient data made it difficult to design and mobilize efficient food aid delivery systems for affected populations. My task for this research project was to identify the degree to which households were able to effectively provide the necessary quantity and quality of food for their families. In doing so, we carried out a rural household survey covering 1,026 households in four lowland areas of the country: East Sepik, West Sepik, Madang, and South Bougainville (Autonomous Region of Bougainville), that asked questions about household consumption and expenditure, agricultural production practices, and livelihood activities. The survey data confirmed some of the worries that the villagers shared with me during my visits. A successful harvest is crucial to survival in rural PNG. Descriptive survey results suggest that rural populations are vulnerable to climate shocks resulting in crop losses. Approximately 70% of the total value of food consumed is produced by themselves. When I asked villagers about their experience during the last El Niño event, many told stories of losing loved ones due to lack of food or increased incidents of disease. However, not everyone had the same story, and the survey data helped to provide a more nuanced picture of food security and nutrition in the survey villages. We found that approximately 44% of surveyed individuals are poor (with total expenditures below the national poverty line or $1.21 per day). 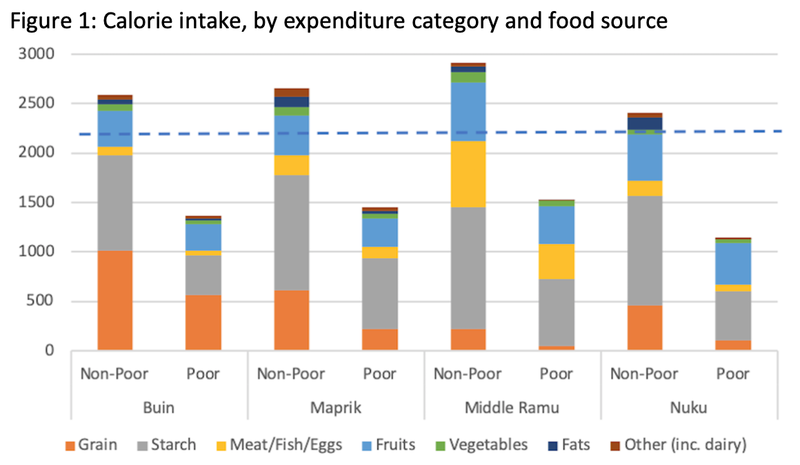 A large share of individuals within poor households do not consume enough calories to live a healthy life (Figure 1). IFPRI. Source: Authors' calculations. Note: Dotted line shows the suggested daily caloric intake level of 2,250 calories / adult equivalent / day weighted values. An even larger share of individuals is not eating enough of the “right” calories, whereby both poor and non-poor are not consuming the recommended daily protein intake. The lack of sufficient quantity and quality of calories may be leading to PNG’s sobering growth and development outcomes in young children. Approximately 29% of children under 5 years old in the sample were stunted (too short for their age) in their growth and approximately 7% were wasted (low weight for their height). Stunting leads to poor educational performance, lower labor productivity, and a greater risk for health problems throughout life. Wasting is an indicator of acute malnutrition that has led to a failure to gain weight or a loss of weight, and in extreme cases can lead to death. Augmenting the data systems within PNG will improve the country’s overall development trajectory in several ways by: Making emergency aid relief more efficient and better targeted to populations-in-need; informing program design to ensure investments have significant impact on poverty reduction and food security; and informing government and development aid funding via robust evaluations of program activities and outcomes. Building on this important data collection effort, future analyses will investigate the correlates of poverty and undernutrition in the survey areas. In addition, IFPRI plans to work with government partners to build a data system that can provide improved monitoring of household needs and food security levels across the country. Continued data collection and analysis are critical to achieving the outcomes and objectives outlined in PNG’s strategic development plan. Equally important is a concerted effort in institutional and individual capacity building to support data-driven policy analysis and dialogue. 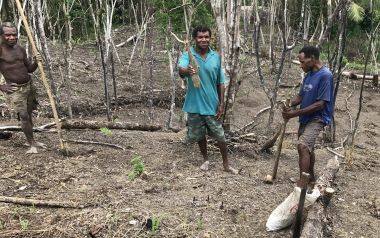 Through these efforts, improved data collection and analysis can provide a foundation for effective action to alleviate poverty and undernutrition in Papua New Guinea. Emily Schmidt is a Research Fellow in IFPRI's Development Strategy and Governance Division. This post first appeared on the Thomson Reuters Foundation site. Funding for this research was provided by the Australian Department of Foreign Affairs and Trade (DFAT) and the CGIAR Research Program on Policies, Institutions, and Markets (PIM) led by IFPRI.